Drain Repair, Lakeland, FL | A Step Above Plumbing Inc. Drain Repair, Lakeland, FL | A Step Above Plumbing Inc.
Our drain repair services are available at reasonable prices in Lakeland. You may notice a few different signs that tell you it’s time for drain repair. A slow drain during your normal routine is often the first signal. In fact, there are lots of ways that your drains can become damaged over time, including washing grease and other items down the sink or the use of chemical drain cleaners and other harsh cleaning methods. 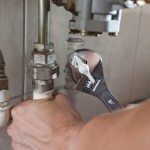 At A Step Above Plumbing Inc., we are here to assist you when your attempts to repair your drains on your own haven’t worked, and we’ll get to the bottom of the problem quickly and efficiently. Drain repair can be a big pain, especially because you rely on your plumbing fixtures and pipes each and every day. At A Step Above Plumbing, we believe you should be able to enjoy the peace of mind that comes with knowing your drains, faucets, pipes and fixtures are all in working order. Our drain repair services are available at reasonable prices, and our plumbing contractors are experienced in dealing with drain repair issues of all shapes and sizes. Since 2003, our team at A Step Above Plumbing Inc. has been providing high-quality plumbing solutions for our customers in Lakeland, Florida. Our customers will tell you they never need to turn anywhere else for their plumbing services because of the quality of our workmanship and excellent customer service. If your own attempts to resolve your drain repair concerns have failed, all you need to do is give us a call, and we’ll be happy to provide the services you need.